– Most nurses behave professionally and ethically. – A tiered approach to intervention when unprofessional behavior occurs offers the opportunity for self-directed, nonpunitive change that prevents a pattern of behavior. – Proper intervention training helps to build and maintain a culture of professionalism. What does it mean to be a professional? Providing care of the highest technical quality, of course. But professionalism also includes communicating clearly, being selfreflective, and consistently modeling responsibility, respect, and advocacy. Professionalism for nurses has always meant healing the sick, nurturing the wounded, placing patients first, providing holistic care, and educating new professionals. These qualities are reinforced in statements of nursing ethics and conduct. But behaviors that undermine a culture of safety persist. 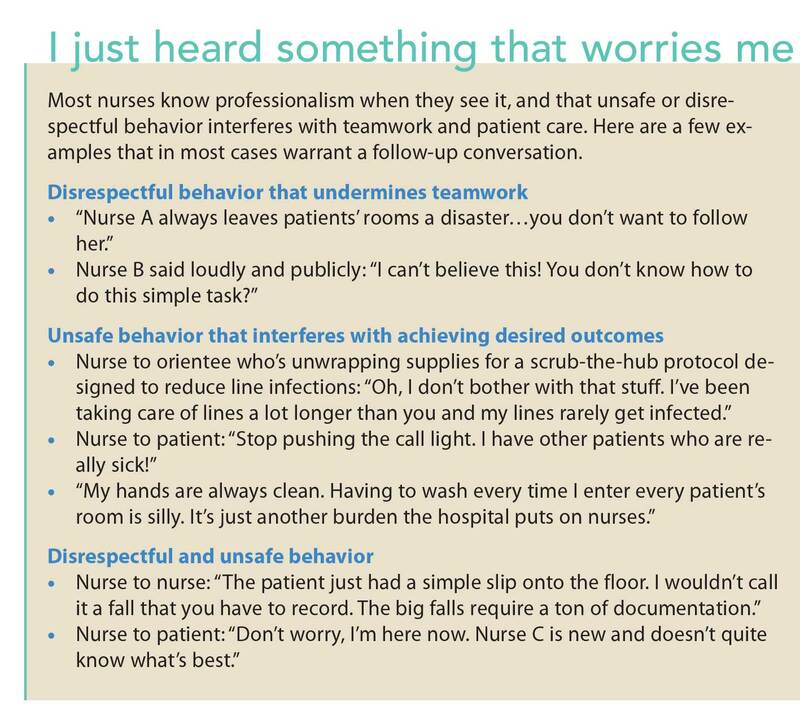 This article is the first in a series that describes strategies nurses and other healthcare team members can use to address unprofessional behavior and promote accountability. • multilevel, systemwide professional training in intervention-related communication skills. Communication skills training is important, but those conducting interventions will lack essential support without an associated infrastructure, genuine leadership commitment, and meaningful data. Managers and leaders have responsibility for knowing and pursuing their organization’s vision, mission, and goals. To be successful, leadership responsibilities include holding all team members accountable for modeling professional behaviors, routinely enforcing the group’s code of conduct equitably regardless of seniority or status, and taking timely action designed to address behaviors or performance that undermine a culture of safety. In addition to leadership, organizations need policies, resources, and surveillance tools to identify both single events and emerging patterns that are inconsistent with the organization’s mission, values, and goals. To reduce the likelihood a pattern will emerge, your organization should consistently address single events. Then, when a pattern appears or persists, leaders must design and hold clinicians accountable for action plans intended to improve performance. We advocate a tiered intervention model. (See Promoting Professionalism Pyramid.) The interventions associated with this model are summarized below. Note that the pyramid’s base reflects the fact that most healthcare team members consistently perform as professionals and simply need occasional recognition for work well done. In a healthcare culture that embodies professionalism, clinicians willingly share concerns. They understand the need to act respectfully and that failure to act not only is noticed by patients, families, peers, and other team members, but also can threaten trust. However, you may encounter barriers to action. Overcoming those barriers requires consistently implementing a proven process and the skills for providing feedback. The pyramid’s first intervention level suggests that when what appears to be a single slip or lapse occurs, all that may be needed is an informal conversation between peers, what we call Cup of Coffee conversations. In our view, single incidents generally do not require investigation, which may provoke disputes, fail to identify the truth, and delay sharing. However, single incidents involving allegations of serious conduct (for example, violations of law or organizational policy, such as practicing under the influence, impairment, and inappropriate touch) do mandate leadership-level investigation and management. The pyramid model illustrates the reality that most clinicians, given such feedback, will change behavior. In the rare cases where a pattern of unprofessional behavior emerges, a peer messenger or manager who’s authorized to have access to the data demonstrating a pattern and has had intervention skills training performs an Awareness intervention. The messenger talks to the clinician about the data that suggests a pattern of unprofessional behavior, assuring him or her that the information is confidential. Consistent with professional self-regulation, no recommendations are offered other than to ask the clinician to review the data, consider what might prevent recurrences, and explain that follow-up will be provided. Awareness messages are effective in 75% to 80% of cases in our work with physicians and advanced practice professionals. If the pattern persists, the clinician’s manager, supervisor, or other authority figure in the organization’s chain of command shares the findings with the clinician and implements an agreed upon plan to reduce and eliminate recurrences in a Guided Intervention Under Authority. If the pattern remains unchanged despite these efforts, managers and leaders may need to invoke and scrupulously follow the organization’s Disciplinary procedures. Appropriate interventions thoughtfully communicated can help maintain professionalism in health care, benefitting the healthcare team and patients. 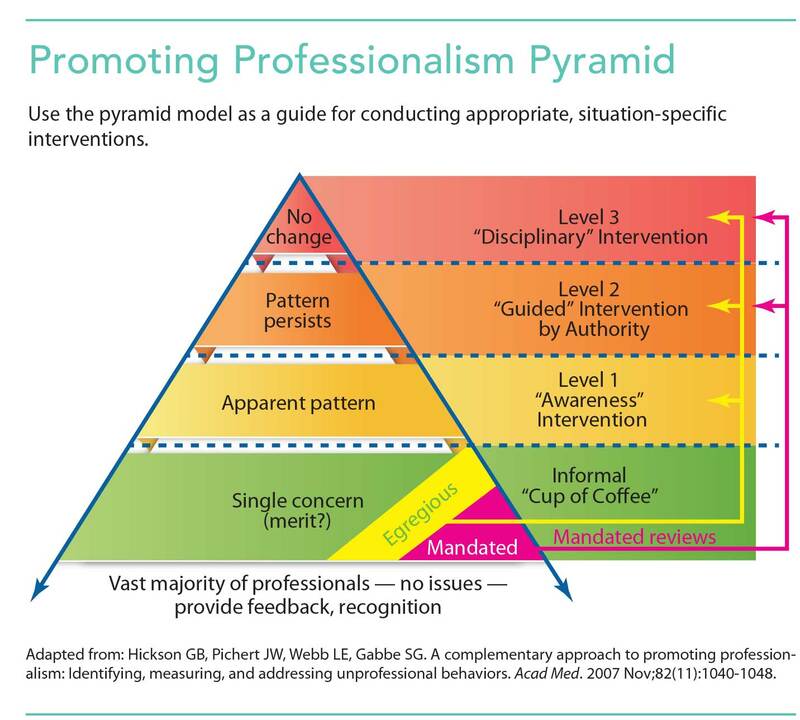 In upcoming articles, we’ll describe the skills required for Cup of Coffee, Awareness, and Guided Intervention Under Authority conversations (interventions) associated with each level of the Promoting Professionalism Pyramid. All authors work at Vanderbilt University Medical Center in Nashville, Tennessee. Marilyn Dubree is the executive chief nursing officer in clinical enterprise administration; April Kapu is associate chief nursing officer of advanced practice; Michelle Terrell is the director of advanced practice at Monroe Carell Jr. Children’s Hospital; James W. Pichert is professor of medical education and administration at the Vanderbilt Center for Patient and Professional Advocacy; William O. Cooper is professor and vice chair in the department of pediatrics, professor in the department of health policy, and director of the Vanderbilt Center for Patient and Professional Advocacy; Gerald B. Hickson is senior vice president for quality, safety and risk prevention, clinical enterprise administration, center for quality, safety and risk prevention. American Nurses Association. Position statement: Incivility, bullying, and workplace violence. July 22, 2015. Hickson GB, Pichert JW, Webb LE, et al. A complementary approach to promoting professionalism: Identifying, measuring, and addressing unprofessional behaviors. Acad Med. 2007;82(11):1040-8. Joint Commission, The. 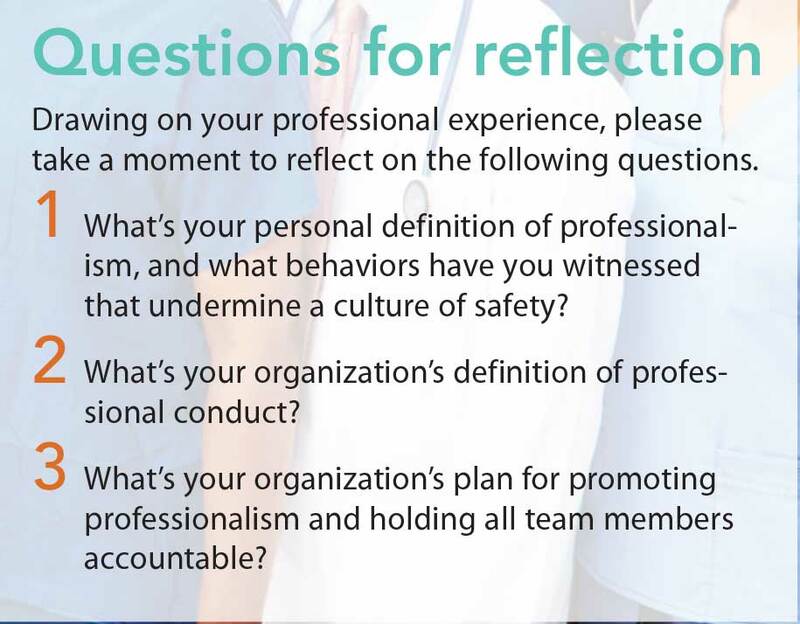 Sentinel Event Alert, Issue 40: Behaviors that undermine a culture of safety. July 9, 2008. Reiter CE, Pichert JW, Hickson GB. Addressing behavior and performance issues that threaten quality and patient safety: What your attorneys want you to know. Prog Pediatr Cardiol. 2012;33(1):37-45. Webb LE, Dmochowski RR, Moore IN, et al. Using coworker observations to promote accountability for disrespectful and unsafe behaviors by physicians and advanced practice professionals. Jt Comm J Qual Patient Saf. 2016;42(4):149-64. Why must I make a service commitment?